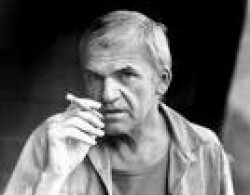 Milan Kundera (Czech: [ˈmɪlan ˈkundɛra]; born 1 April 1929) is a Czech-born French writer who went into exile in France in 1975, and became a naturalised French citizen in 1981. He "sees himself as a French writer and insists his work should be studied as French literature and classified as such in book stores". Kundera's best-known work is The Unbearable Lightness of Being. Prior to the Velvet Revolution of 1989 the Communist régime in Czechoslovakia banned his books. He lives virtually incognito and rarely speaks to the media. A perennial contender for the Nobel Prize in Literature, he is believed to have been nominated on several occasions. Kundera was born in 1929 at Purkyňova ulice, 6 (6 Purkyně Street) in Brno, Czechoslovakia, to a middle-class family. His father, Ludvík Kundera (1891–1971) was an important Czech musicologist and pianist who served as the head of the Janáček Music Academy in Brno from 1948 to 1961. His mother was Milada Kunderová (born Janošíková). Milan learned to play the piano from his father; he later studied musicology and musical composition. Musicological influences and references can be found throughout his work; he has even included musical notation in the text to make a point. Kundera is a cousin of Czech writer and translator Ludvík Kundera. He belonged to the generation of young Czechs who had had little or no experience of the pre-war democratic Czechoslovak Republic. Their ideology was greatly influenced by the experiences of World War II and the German occupation. Still in his teens, he joined the Communist Party of Czechoslovakia which seized power in 1948. He completed his secondary school studies in Brno at Gymnázium třída Kapitána Jaroše in 1948. He studied literature and aesthetics at the Faculty of Arts at Charles University in Prague. After two terms, he transferred to the Film Faculty of the Academy of Performing Arts in Prague where he first attended lectures in film direction and script writing. In 1950, his studies were briefly interrupted by political interferences. He and writer Jan Trefulka were expelled from the party for "anti-party activities." Trefulka described the incident in his novella Pršelo jim štěstí (Happiness Rained On Them, 1962). Kundera also used the incident as an inspiration for the main theme of his novel Žert (The Joke, 1967). After Kundera graduated in 1952, the Film Faculty appointed him a lecturer in world literature. In 1956 Milan Kundera was readmitted into the Party. He was expelled for the second time in 1970. Kundera, along with other reform communist writers such as Pavel Kohout, was partly involved in the 1968 Prague Spring. This brief period of reformist activities was crushed by the Soviet invasion of Czechoslovakia in August 1968. Kundera remained committed to reforming Czech communism, and argued vehemently in print with fellow Czech writer Václav Havel, saying, essentially, that everyone should remain calm and that "nobody is being locked up for his opinions yet," and "the significance of the Prague Autumn may ultimately be greater than that of the Prague Spring." Finally, however, Kundera relinquished his reformist dreams and moved to France in 1975. He taught for a few years in the University of Rennes. He was stripped of Czechoslovak citizenship in 1979; he has been a French citizen since 1981. He maintains contact with Czech and Slovak friends in his homeland, but rarely returns and always does so incognito. Although his early poetic works are staunchly pro-communist, his novels escape ideological classification. Kundera has repeatedly insisted on being considered a novelist, rather than a political or dissident writer. Political commentary has all but disappeared from his novels (starting specifically after The Unbearable Lightness of Being) except in relation to broader philosophical themes. Kundera's style of fiction, interlaced with philosophical digression, is greatly inspired by the novels of Robert Musil and the philosophy of Nietzsche, and is also used by authors Alain de Botton and Adam Thirlwell. Kundera takes his inspiration, as he notes often enough, not only from the Renaissance authors Giovanni Boccaccio and Rabelais, but also from Laurence Sterne, Henry Fielding, Denis Diderot, Robert Musil, Witold Gombrowicz, Hermann Broch, Franz Kafka, Martin Heidegger, and perhaps most importantly, Miguel de Cervantes, to whose legacy he considers himself most committed. Originally, he wrote in Czech. From 1993 onwards, he has written his novels in French. Between 1985 and 1987 he undertook the revision of the French translations of his earlier works. As a result, all of his books exist in French with the authority of the original. His books have been translated into many languages. In his first novel, The Joke (1967), he gave a satirical account of the nature of totalitarianism in the Communist era. Kundera was quick to criticize the Soviet invasion in 1968. This led to his blacklisting in Czechoslovakia and his works being banned there. Kundera's second novel was first published in French as La vie est ailleurs in 1973 and in Czech as Život je jinde in 1979. Set in Czechoslovakia before, during and after the Second World War, Life Is Elsewhere is a satirical portrait of the fictional poet Jaromil, a young and very naive idealist who becomes involved in political scandals. In 1975, Kundera moved to France. There he published The Book of Laughter and Forgetting (1979) which told of Czech citizens opposing the communist regime in various ways. An unusual mixture of novel, short story collection and author's musings, the book set the tone for his works in exile. Critics have noted the irony that the country that Kundera seemed to be writing about when he talked about Czechoslovakia in the book, "is, thanks to the latest political redefinitions, no longer precisely there" which is the "kind of disappearance and reappearance" Kundera explores in the book. Published in Czech (Kniha smíchu a zapomnění) in April 1981 by 68 Publishers Toronto. Kundera's most famous work, The Unbearable Lightness of Being, was published in 1984. The book chronicles the fragile nature of an individual's fate, theorizing that a single lifetime is insignificant in the scope of Nietzsche's concept of eternal return. In an infinite universe, everything is guaranteed to recur infinitely. In 1988, American director Philip Kaufman released a film adaptation. In 1990, Kundera published Immortality. The novel, his last in Czech, was more cosmopolitan than its predecessors, as well as more explicitly philosophical and less political. It would set the tone for his later novels. The 2014 novel focuses on the musings of four male friends living in Paris. The protagonists discuss, among other topics, their relationships with women and existentialism faced by individuals in the world. The novel received generally negative reviews. Michiko Kakutani of the New York Times describes the book as being a "knowing, pre-emptive joke about its own superficiality" A review in the Economist stated that the book is "sadly let down by a tone of breezy satire that can feel forced." Kundera often explicitly identifies his characters as figments of his imagination, commenting in the first-person on the characters in entirely third-person stories. Kundera is more concerned with the words that shape or mold his characters than with their physical appearance. In his non-fiction work, The Art of the Novel, he says that the reader's imagination automatically completes the writer's vision. He, as the writer, thus wishes to focus on the essential, arguing that the physical is not critical to understanding a character. Indeed, for him the essential may not even include the interior world (the psychological world) of his characters. Still, at times, a specific feature or trait may become the character's idiosyncratic focus. François Ricard suggested that Kundera conceives with regard to an overall body of work, rather than limiting his ideas to the scope of just one novel at a time. His themes and meta-themes exist across the entire body of work. Each new book manifests the latest stage of his personal philosophy. Some of these meta-themes include exile, identity, life beyond the border (beyond love, beyond art, beyond seriousness), history as continual return, and the pleasure of a less "important" life. (François Ricard, 2003) Many of Kundera's characters seem to develop as expositions of one of these themes at the expense of their full humanity. Specifics in regard to the characters tend to be rather vague. Often, more than one main character is used in a novel; Kundera may even completely discontinue a character, resuming the plot with somebody new. As he told Philip Roth in an interview in The Village Voice: "Intimate life [is] understood as one's personal secret, as something valuable, inviolable, the basis of one's originality." Kundera's early novels explore the dual tragic and comic aspects of totalitarianism. He does not view his works, however, as political commentary. "The condemnation of totalitarianism doesn't deserve a novel," he has said. According to the Mexican novelist Carlos Fuentes, "What he finds interesting is the similarity between totalitarianism and "the immemorial and fascinating dream of a harmonious society where private life and public life form but one unity and all are united around one will and one faith." In exploring the dark humor of this topic, Kundera seems deeply influenced by Franz Kafka. Kundera considers himself a writer without a message. In Sixty-three Words, a chapter in The Art of the Novel, Kundera recounts an episode when a Scandinavian publisher hesitated about going ahead with The Farewell Party because of its apparent anti-abortion message. Not only was the publisher wrong about the existence of such a message, Kundera explains, but, "I was delighted with the misunderstanding. I had succeeded as a novelist. I succeeded in maintaining the moral ambiguity of the situation. I had kept faith with the essence of the novel as an art: irony. And irony doesn't give a damn about messages!" Kundera also ventures often into musical matters, analyzing Czech folk music, quoting from Leoš Janáček and Bartók. Further in this vein, he interpolates musical excerpts into the text (for example, in The Joke), or discusses Schoenberg and atonality. On 13 October 2008, the Czech weekly Respekt prominently publicised an investigation carried out by the Czech Institute for Studies of Totalitarian Regimes, which alleged that Kundera had denounced a young Czech pilot, Miroslav Dvořáček, to the police in 1950. The accusation was based on a police station report which named "Milan Kundera, student, born 1.4.1929" as the informant in regard to Dvořáček's presence at a student dormitory; information about his defection from military service and residence in Germany was attributed in the report to Iva Militká. Dvořáček had fled Czechoslovakia after being ordered to join the infantry in the wake of a purge of the flight academy; he returned to Czechoslovakia as an agent of a spy agency organised by Czechoslovak exiles. The police report does not mention his activity as an agent. Dvořáček returned secretly to the student dormitory of a friend's former sweetheart, Iva Militká. Militká was dating (and later married) a fellow student Ivan Dlask, and Dlask knew Kundera. The police report states that Militká told Dlask of Dvořáček's presence, and that Dlask told Kundera, who told the police. Although the Communist prosecutor sought the death penalty, Dvořáček was sentenced to 22 years (as well as being charged 10,000 crowns, forfeiting property, and being stripped of civic rights). He ended up serving 14 years in a labor camp, some of it working in a uranium mine, before he was released. Many critics in the Czech Republic condemned Kundera as a "police informer," but many other voices sharply criticised Respekt for publishing a badly researched piece. The short police report does not contain Kundera's signature, nor does it contain any information from his ID card. Kundera was the student representative of the dorm Dvořáček visited, and it cannot be ruled out that anyone could have reported him to the police using Kundera's name. Contradictory statements by Kundera's fellow students were carried by the Czech newspapers in the wake of this "scandal." "Historian" Tomáš Hradílek was criticised for an undeclared conflict of interest: one of the protagonists of the incident was his relative. The Prague-based Institute for the Study of Totalitarian Regimes is regarded by many as a propagandistic institution. It states on its website that its task is to "impartially study the crimes of the former communist regime." Critics also accused Respekt of using Kundera's name to boost its failing circulation. On 3 November 2008, eleven internationally recognized writers came to Kundera's defence: these included four Nobel laureates -– J. M. Coetzee, Gabriel García Márquez, Nadine Gordimer and Orhan Pamuk -– as well as Carlos Fuentes, Juan Goytisolo, Philip Roth, Salman Rushdie and Jorge Semprún. In 1985, Kundera received the Jerusalem Prize. His acceptance address is printed in his essay collection The Art of the Novel. He won The Austrian State Prize for European Literature in 1987. In 2000, he was awarded the international Herder Prize. In 2007, he was awarded the Czech State Literature Prize. In 2009, he was awarded the Prix mondial Cino Del Duca. In 2010, he was made an honorary citizen of his hometown, Brno. In 2011, he received the Ovid Prize. The asteroid 7390 Kundera, discovered at the Kleť Observatory in 1983, is named in his honor.